75 years ago, America turned on its radio sets, and heard Sausalito. A live radio broadcast heard from coast to coast commemorated the opening of the Marinship Plant which changed our community forever and employed 20,000 people through the War. 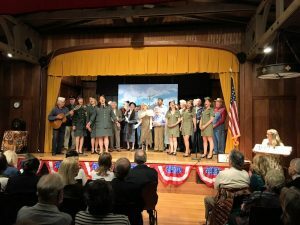 This week on Radio Sausalito, well be reliving this historic broadcast through a live dramatization featuring songs, stories, and comedy! (Cast and Crew list & photos) We’ll also rehear the original radio broadcast as it happened in 1942.